Vismaya water theme park kannur is one of the most enjoyable water park in Kerala which is situated in Parassinikadavu, Kannur. Read more to know the main attractions, rides, timings, rates, discounts, official website and other facilities that are available at Vismaya water theme park. Vismaya water theme park is one of the best amusement parks of India located near Taliparamba in Kannur, Kerala. The address for the park is Parassinikadavu in Kannur. A famous temple called Muthappan temple, where people worship Lord Sree Muthappan, is also located near the theme park. The unique feature of this temple is that it is the only Hindu temple in Kerala in which the Theyyam performance takes place daily as a ritual offering. 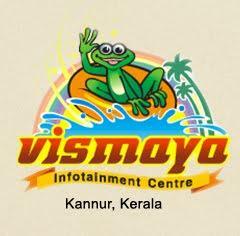 Vismaya is managed by Malabar Tourism Development Co-operative Limited (MTDC). Opened in 2008, it have since been one of the most visited attraction by tourists in Kerala. The park spans across many acres and the water used for the rides are operated by rain water which is collected by the reservoir. 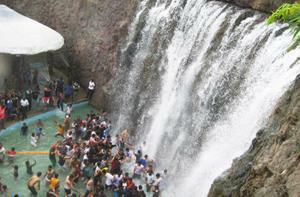 The slogan or caption of Vismaya water theme park is 'Ullasam Ellarkkum' which means 'Fun for everyone'. 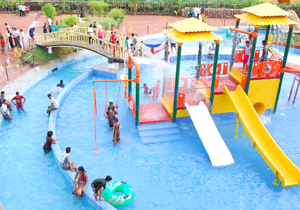 The park has water and adventurous rides as well as some informative activities for the young ones. 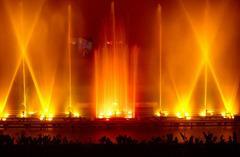 The main attractions in Vismaya water theme park are the Virtual Waterfall and Laser show. Virtual waterfall is a waterfall where people can tap their feet and dance to a music which is played in the background. This attraction takes place only for an hour daily between 2pm to 3pm. The Laser Show is also another mesmerising performance in which laser beams are flashed across the park in specific ways. It is definitely a worth-watching and mind-blowing show. The entire water used in the park comes from reservoir which is spread over two acres of the park. The highlight of Vismaya park is the rain water harvesting project undertaken by the park. This feature makes it completely different from all the other theme parks in India. It is one of the environmental friendly water theme parks in the world. The park provides many facilities such as prayer halls, restaurants, conference halls, shops and dormitories. 1. Aqua Trail - This is the ultimate fun water ride. It is a whirling ride which goes through a tube and the slides end up with a splash into the water. 2. Wave Pool - This is one of the most enjoyable rides in the theme park in which people of any age can splash against the waves and try to overpower them. 3. Electric Swing - This is a magical ride in which you will be swung high into the air and brought back to the ground. Surely a thrilling ride for adults. 4. Sky Train - Colourful fish shaped trains will take you on a voyage which is interesting and thrilling for both adults and children. 5. Giant Wheel - This is one of the most common rides in any amusement parks. While sitting in the cars of the giant wheel, you will be taken to zero gravity where you can feel your adrenaline raise to a high level. You can also see a huge part of Kannur city when you reach the top. 6. Striking car - This is a thrilling ride in which kids or even young adults can sit in the cars and bump into each other without any fear of crashing or hurting anyone. 7. Tornado - This is another wonderful ride in which you will be lifted up in the air and spun around weightless. 8. Twister - This ride consists of huge enclosed tubes which are so long and you will wonder where the tunnel ends. 9. Jumping frog - Kids will enjoy this ride to the maximum. It is a bouncing ride which is sure to entertain your kids and keep them happy. 1. Prayer hall - People who want to de-stress and wish for some recreation and a place to offer your prayers to the Lord, the theme park provides a silent spacious room for prayers. 2. Dormitory - If you wish to stay at Vismaya theme park and enjoy more days in the park, you can bring your belongings and beds and keep them in the dormitory provided by the park. A minimal fee of Rs 50 per head will be charged. 3. 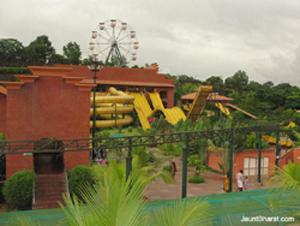 Restaurant - The water theme park also provides restaurants which offer tasty Kerala-style food. You can make advanced booking of your table in the restaurant. 4. Convention hall - The water theme park also provides a space for official meetings and for family get-togethers. The hall can be booked in advance. Weekdays - 11am to 6pm. Holidays - 10.30am to 6pm. By road - 18kms (towards North) from Kannur and 8kms (towards South) from Taliparamba. By train - Kannur has an exclusive railway station named Kannapuram which is around 11kms from park. Thus, it is well connected to all parts of Kerala and nearby states. By air - The nearest airport to Kannur is located in Calicut. The airport is located at a distance of 26 kilometres from Calicut railway station. It takes almost one hour to reach Kannur from Calicut via train service.